Well gang, we have covered bodyweight exercises fairly extensively. If you want to take it up a notch – it’s time to add in some weight training. Nothing will make you look better, feel better, ramp up your metabolism and improve hormone levels better than weight training. You can do this at home or in a gym with barbells and/or dumbbells. We’ll kick off our Weight Training Series with one of the foundational movements–the Deadlift. While the dead lift is indisputably one of the very best exercises for strengthening the hips and back if done incorrectly or with more weight that your core can support you can hurt yourself. If you do not have a clue I would suggest some professional help initially to make sure you learn proper form and technique. Some of us are quite adept at watching a video or reading instructions and putting it into practice but some of us are not. Safety comes first so train smart. You can even start with no weight. 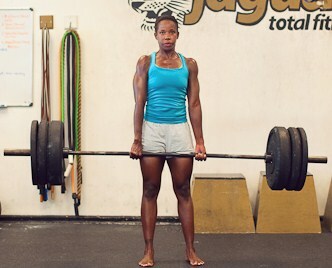 I have had many clients really feel the effects of “weightless” dead lifts. If you do not have a piece of pvc or a wooden dowel a broomstick is also very effective. Besides, it’s almost Halloween. . .so grab yours and let’s get started. . .
A deadlift is nothing more than the name applies–you are lifting dead weight from the floor. A most functional movement used everyday in sports and activities of daily living without even realizing it. If you are not using a barbell with bumper plates or a 45 lb plate on each end (as most of us will not be in the beginning) you will start with your empty bar, pvc, dowel or broomstick from mid shin. Once you get in the “set up” or initial position I would practice holding it for 10-30 seconds. Feel where your body is and review the above points. A common fault is letting the weight roll forward into the toes so “float your toes” meaning lift them off the floor insuring that your weight is indeed in your heels. Is your chest up – you want no rounding of the back what so ever in your movement. Ask someone to critique you from the side. Are your shoulder blades retracted (pulled together and slightly down the back)? Are your arms locked (triceps engaged)? If the answer to the above is yes, you’re ready to deadlift. In plainer terms, stand up and pull back. Go slowly at first taking time to reset the back, making sure weight is in the heels and chest is up between each deadlift. After you are fairly comfortable with the movement begin adding a little power or explosiveness to it. Not excessive but imagine that broomstick weighs a hundred pounds. After you can deadlift your bar or pvc 10-15 times with good form and no pain in the knees or lower back add some weight. Advanced: Build strength by challenging yourself with a weight that you can perform for 3 to 6 reps, giving yourself 2 to 3 minutes between lifts when working at that rep range. Incorporate a lighter weight for 8 to 15 reps with a little less rest in the same workout. I would include them no more than once a week; done heavy enough and with the right intensity they are quite effective but also need adequate recovery time. Think this movement is relegated only to big strong men, think again. Take a look at this inspiring photo from one of our entries in the nationwide Deads n Dresses competition which showcases strong yet feminine women. So, Ladies and Gentlemen: wake up your dead and develop a strong and pain free lower back.